By Abdi Haid: IBF super middleweight champion James “Chunky” DeGale (22-1, 14 KOs) says he’s interested in facing IBF/IBO/WBA middleweight champion Gennady “Triple G” Golovkin (34-0, 31 KOs), but for that fight to happen, Golovkin will need to move up in weight. DeGale believes that it’ll be an even fight when Golovkin does move up in weight because his punching power won’t be as pronounced in the 168lb division as it is at 160 right now against the opposition he’s been facing. DeGale says Golovkin is short and only 5’9″, and he believes he’s going to have some serious tests when he goes up a weight division. Golovkin’s promoter Tom Loeffler is interested in having him fight in the UK this year against possibly Chris Eubank Jr., Billy Joe Saunders or DeGale. Saunders is the guy that they would like to fight most of all, but that might might not be doable at the moment. Saunders wants to get a couple of title defenses under his belt before he looks to unify his title. Golovkin vs. DeGale would be a good fight if it could get made. Golovkin has the kind of punching power that would likely travel up with him to super middleweight. It would be a tough fight for DeGale because he’s easy to hit despite his movement, and he bruises up quickly in his fights. DeGale has never fought a real big puncher before other than in his fight against Bute, but this was a past his prime Bute. DeGale won the vacant IBF super middleweight title last year in May in beating Andre Dirrell by a 12 round unanimous decision. 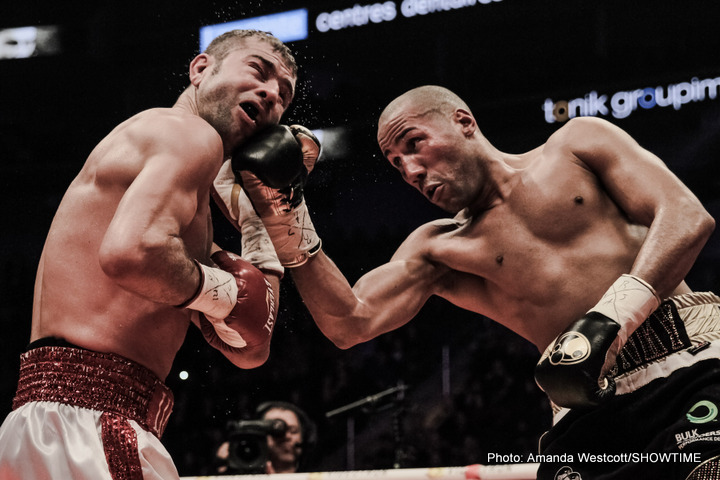 In DeGale’s first defense of his title, he beat former IBF champion Lucian Bute by a 12 round unanimous decision last November in a closer than expected fight. The judges scored the fight 117-111, 117-111 and 116-112. However, there were some boxing fans who felt that Bute did enough to deserve a draw out of the fight. At the very least, it was a fight a lot closer than scores given out by the three judges.